Jump start to see emerging mobile user interface design patterns. We build User Experience - immersive, engaging and sticky experiences that sustain the needs of passionate users. *We make software more productive, simple, approachable and fun. 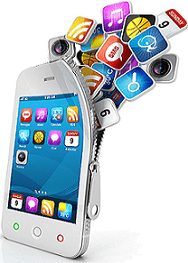 *We have proven track recordÂ in developing and customizing mobile applications for clients all over the world. *Our domain expertise includes multiple mobile platforms including iPhone / iPad, Android and Blackberry. *Dedicated team of mobile design experts to make your project a complete success.